Bluebell, Moorhead Farm in Woolsery, near Clovelly sleeps 4 people. A selection of holiday apartments taken from this complex situated in the beautiful North Devon countryside. 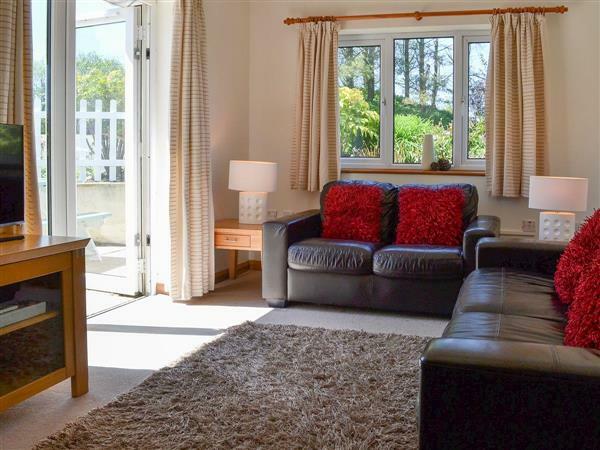 The apartments are located on a well equipped complex close to the Hartland peninsula. The complex has a wide range of in-house activities including a heated indoor swimming pool and hot tub area, a well equipped gym and games room. Outside there is a well stocked fishing lake, with a few weighing as much as 20lb, in stunning surroundings and a pitch and putt course which takes you around the complexes 10 acre site. In the evening there is a fully licensed bar and restaurant to enjoy and give a relaxing end to the day with family and friends. All on ground floor: Living room with French doors/dining room/kitchen. 2 bedrooms: 1 double with en-suite bathroom and toilet, 1 twin with en-suite shower room and toilet. Elec central heating and gas included. Travel cot and high-chair on request. Gas cooker. Dish washer. Fridge/Freezer. Patio with sitting-out area and furniture. Wheelchair access. Holidays run from Friday to Friday. For a better idea of where Moorhead Farm - Bluebell is, you can see Moorhead Farm - Bluebell on the map below. Moorhead Farm - Bluebell is in Devon; should you be on the lookout for a special offer, you can find all the special offers in Devon. It's always worth checking to see what is on offer at the moment. Do you want to holiday near Moorhead Farm - Bluebell (B6849), you can see other cottages within 25 miles of Moorhead Farm - Bluebell; have a look to find your perfect holiday location.